Save Marinwood-Lucas Valley - our community, our future: Crystal Ball Communism: "Toward Soviet America"
Toward Soviet America by William Z. 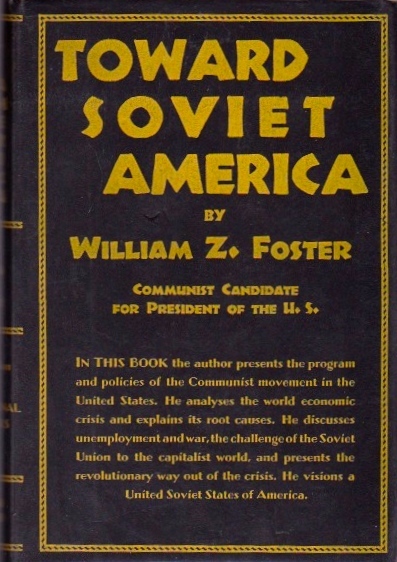 Foster, CPUSA chairman, was first published in 1932. Later, copies of the book would be purged and almost eliminated entirely from American bookstores and libraries in what was presumably the CP response to the latest Moscow line; but surely it was also to try to put this spitting Soviet-American cat back in the bag. Interestingly, the book would be reprinted in 1961 with a foreword and commentary by the chairman of the House Committee on Un-American Activities, Rep. Francis E. Walter, who recommended that every American read it as a blueprint of Soviet intentions much like Mein Kampf was a blueprint of Hitler's. The 1932 version (sans HCUA commentary) is now available online. For the first time, I just picked up my new 1961 copy, formerly from the library of the late, great Stanton Evans, opened it at random, and found myself reading about what the Soviet-American world of tomorrow looked like back in 1932 to a Communist Party official under Stalin's tight control. Eight decades later, it is shocking how many of Foster's Kremlin-approved prophesies have come true -- more counter-conventional evidence of the extent to which our "victory" in the so-called Cold War was in fact an ideological rout, particularly at home. This is a main theme of exploration in American Betrayal. What continues to be clear is that none of this is "history." Just from today's headlines, for example, it is reported that the IMF is likely to promote China's yuan into the "basket of currencies" on a par with the dollar. This isn't a brand new, discrete development so much as it is the latest installment of a continuing Communist saga. That would be Communist China, of course, and that would be the same IMF whose first US director was Harry Dexter White, a Communist agent-extraordinaire inside the Roosevelt and Truman administrations, whose personal machinations on Stalin's behalf greatly assisted, among other world-changing events, the cataclysmic Communist takeover of China in 1949. It turns out that the "history" of Communism, from the IMF abroad to the "cultural revolution" on the college campus at home, is continually breaking news; or, worse, the status quo. And note: Foster is using the phrase "cultural revolution" (below) several decades before Mao. Beginning on p. 316, here are some of Foster's prophesies, a mix of recognizable present-day conditions and ...? Among the elementary measures the American Soviet government will adopt to further the cutlural revolution are the following: the schools, colleges and universities will be coordinated and grouped under the National Department of Education and its state and local branches. The studies will be revolutionaized, being cleansed of religious, patriotic and other features of the bourgeois ideology. The students will be taught on the basis of Marxian dialectical materialsm, internationalism and the general ethics of the new Socialist society. Present obsolete methods of teaching will be superceded by a scientific pedagogy. The whole basis and organization of capitalist science will be revolutionized. Science will become materialistic, hence truly scientific; God will be banished from the laboratories as well as from the schools. Science will be thoroughly organized and will work according to plan; instead of present-day individualistic hit-or-miss scientific dabbling, there will be a great organization of science, backed by the full power of the government. This organization will make concerted attacks upon the central problems, concrete and abstract, that confront science. One of the basic concerns of the workers' government will be, naturally, the conservation of the health of the masses. To this end, a national department of Health will be set up, with the necessary local and State sub-divisions. A free medical service, based upon the most scientific principles, will be established. The people will be taught how to live correctly. They will be given mass instruction in diet, physical culture, etc. A last end will be put to capitalist medical quakery and the adulteration of food. A Communist world will be a unified, organized world. [NB: Remember, Communist agent and Roosevelt era State Department official Alger Hiss would foster the United Nations into existence.] The economic system will be one great organization, based upon the principle of planning now dawning in the U.S.S.R. The American Soviet government will be an important section in this world organization. In such a society there will be no tariffs or the many other barriers erected by capitalism against a free world interchange of goods. The raw material supplies of the world will be at the disposition of the peoples of the world. At this point, Foster cranks up the hosannas for the U.S.S.R.'s "peace policy," "plan for doing away with war," etc. (similar, in reality, to Islam's "submission" doctrine). "Deadly individualism is doomed," he writes. "The collectivist society of Socialism, by freeing the masses from economic and political slavery will, for the first time in history, give the masses an opportunity to fully develop and express their personalities." Don't look now but this last prediction is something Nancy Pelosi explicitly champions as a benefit of Obamacare. Foster: "Theirs will be an individuality growing out and harmonizing with interests of all." The scariest "prediction" of all.